The regional political party known as the Oromo Federalist Congress reports that upwards of 80 people have been killed over the past four weeks by government forces. The government has yet to release its own updated numbers, but said on December 15 that five people had died. Alongside increasing tensions around protests, security forces have arrested two opposition politicians, two journalists, and summoned five bloggers — all members of the Zone9 collective, who were acquitted of baseless terrorism charges just two months ago — to appear in court on December 30. The government has also reinforced censorship campaigns against US-based Ethiopian satellite TV channels as well as protest songs that were produced in solidarity with Oromo protesters. 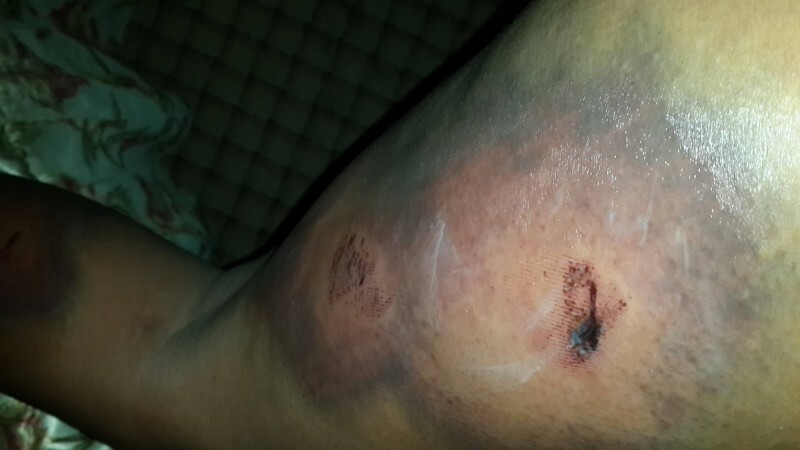 Torture marks on musician Hawi Tezera after she was arrested for supporting Oromo student protesters with music. Photo shared on Facebook by Jawar Mohammed. Protesters of the “Master Plan” to expand the capital city, Addis Ababa, into Oromia fear that the proposed development will displace large numbers of farmers mostly belonging to the Oromo ethnic group. Since demonstrations across the region began, the Ethiopian government has tried hard to stifle any kind of information about the outcry. However, photos, videos and audio materials captured on mobile phones of the protests and of police brutality have made their way out of the country and are widely shared on the US-based satellite TV channels ESAT and Oromia Media Network (OMN). These two channels reach tens of millions of Ethiopians who don’t have access to the Internet but who do have satellite dishes and depend on the two channels for news, analysis and views about the protest in Amharic and Afan Oromo, two of Ethiopia’s major languages. Notice: OMN is NOT back on satellite yet. It was NOT jammed either. Transmission was discontinued by the service provider under duress. The satellite we were on Eutelsat 8WB is still not jammable. Stay tune for details as soon as piece it together.And the promise remains the same; OMN will be back on air very soon one way or another! The management of the Ethiopian Satellite Television and Radio (ESAT) said the regime in Ethiopia has jammed one of its two satellites, Eutelsat E8WB @ 8West starting the morning of Saturday December 19, 2015. 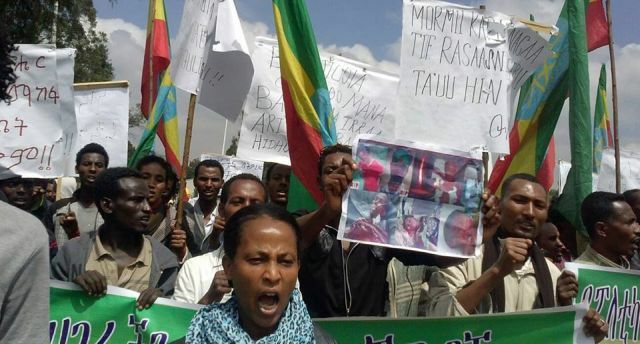 .This latest move by the regime came at a time when ESAT has been widely covering the growing protest against the tyrannical regime in Ethiopia. Ethiopians rely on ESAT for news and information about their country. The regime, known for muzzling press freedom and one of the top jailers of journalists in the world, is spending millions of dollars on jamming equipment to deny people access to information. 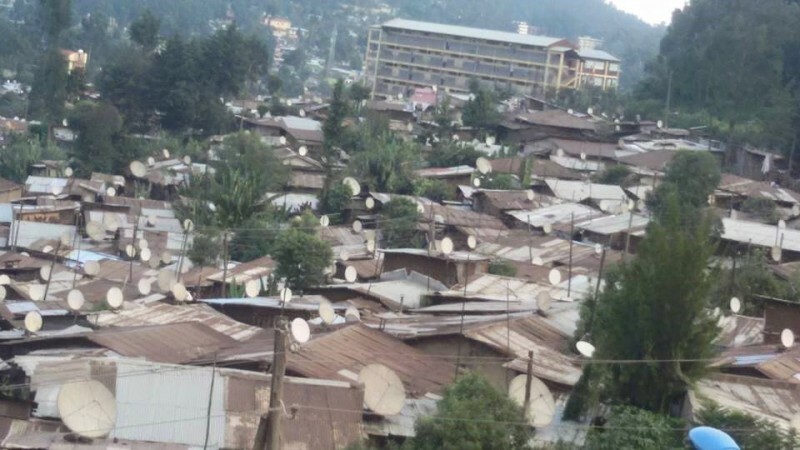 Citizen reports on Facebook indicate that Ethiopian authorities have started to frantically send security forces around to remove satellite dish receivers from the rooftops of residents particularly in Oromia region. They [Ethiopian government] are wrong if they think all these satellite dish receivers are set up to watch their tired propaganda. The War on Satellite Dishes Continue. If the regime thinks it can cut our audience off from receiving OMN news and programs, they are too dumb to understand what we are made off. Just as we beat them time and again during their 10 jamming in the last 18 months, we will beat them again by staying several steps a head of them. Even if they take down every dish in the country, we will still find a way to reach our audience. Time for them to give up and face up to the truth! Both ESAT and OMN say that in the past, they have moved their signals to other satellites that are harder for the Ethiopian government to jam. They both frequently notify their audiences in Ethiopia and advise them to re-position their dishes accordingly. The Ethiopian authorities see these channels as mouthpieces of outlawed oppositions groups engaged in destabilizing the country. Although the government usually denies jamming satellites services, media outlets such as France24, Deutsche Welle and BBC have all condemned Ethiopian authorities for interfering with their broadcasting abilities. Ethiopian authorities’ satellite jamming is similar to Internet censorship, whereby the government blocks access to websites, blogs and online radios, which are mostly set up by journalists and activists living in exile. Ethiopia tops the list of countries forcing journalists to flee into exile for fear of persecution.